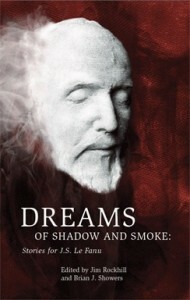 Swan River Press is publishing a tribute anthology this month, Dreams of Shadow and Smoke: Stories for J.S. Le Fanu, which is available for order here. The delightful Brian J. Showers and Jim Rockhill (editors both) answer a few questions for me about what prompted this anthology and Le Fanu’s enduring influence over other writers. 1. What was the impetus behind this Le Fanu tribute anthology? Brian: That’s an easy one! This year is his 200th birth anniversary, so it would almost be foolish not to do something literary to commemorate that. But the more personal answer is that Le Fanu is an author who is close to my heart, which is to say I’m not doing this book just because of the anniversary, but because I wanted to see how other writers respond to the themes in his work. It’s something I’d been doing in my own stories (when I write them! ), so Dreams of Shadow and Smoke is something of an extension of that curiosity. I’d like to add, though, that the stories in this anthology are not simply pastiches. The subtitle of the book is “Stories for J.S. Le Fanu”. These are modern stories by modern writers who are responding to the themes in Le Fanu’s work in their own ways. I like to look at it as a show of appreciation, a serious consideration for what Le Fanu wrote. It’s a nifty little birthday gift I really wish I could give to him. I’ve been keep a list of events happening this year for the bicentenary, including public talks, exhibitions, plays, etc., which you can find here. And for those who can’t make it to Dublin, or anywhere else that’s holding an event, you can join us on our Facebook page, Le Fanu at 200. 2. 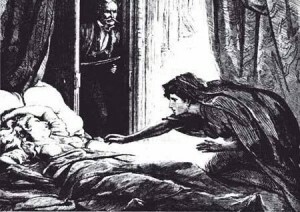 What do you think still appeals to readers of Le Fanu’s fiction? Brian: I was just talking to Jim Rockhill today, who co-edited the anthology with me, and we were talking about how Le Fanu’s stories have a sort of closeness to them, the way they work themselves into the reader’s mind, they seem more real and therefore more troubling. Le Fanu had a way with detail, and a deft ability to convey those supernatural moments that stick with you for a long time afterward. Jim put it more eloquently though: He said that Le Fanu’s stories implied something fundamentally wrong with the world. Even though I’ve read “Green Tea” approximately one billion times, the end is something that still jars me. The Reverend Jennings’s fate is really unavoidable from the start: he is doomed from the very first page. I think Jim’s observation sums it up perfectly. 3. What’s your favourite Le Fanu story? And was it the first one you read? Brian: It’s hard to recall which story I read first, though I’m fairly certain it was “Green Tea”. As for my favourite story, well, it depends on my mood, I suppose. And the person I’m recommending stories to. “Green Tea” has that touch of absurdity that I love. “Schalken the Painter”, like “Green Tea”, has a bleakness to it that’s hard to evade. It’s the sort of story that stalks you and corners you–and there’s nothing you can do about it. And then there’s “The Child that Went with the Faeries”, one of Le Fanu’s later works and a return to the rural Irish setting that all but disappeared after his early short stories. This tale sticks with me because of its haunting description of landscape and the sinister possibilities that linger at the edges of remote places. Jim: I would not argue with any of these, and I particularly love the way Le Fanu describes the shifting light and shadow from the mound of the Slieveelim hills in “The Child that Went with the Fairies”. Two of my favorites, which do not tend to receive as much attention as I think they deserve are “Ultor de Lacy” and “The Haunted Baronet”, each of which is particularly rich in the variety of supernatural phenomena they describe and atmospheric descriptions of the world in which they occur. 4. Which writers do you think owe their literary DNA to the work Le Fanu did? Brian: I’m going to be bold and say any writer who describes his or her work as Jamesian. M.R. James really owed quite a debt to Le Fanu in the way he constructed his stories, and in the conveyance of the uncanny. I think James would be the first to acknowledge this too. And certainly he refined the art of the ghost story, there’s no question about that. After all, James’s name is now an adjective, unlike Le Fanu’s. But I think the Jamesian has very deep roots in Le Fanu’s work. Jim: Yes, I think the entire sense of history permeating everything in the present is a legacy James inherited from Le Fanu. I also think you can see traces of Le Fanu in the way Henry James handles his ghosts. Remember that in stories like “Ultor de Lacy”, “The Haunted Baronet”, the contents of In A Glass Darkly, and others, the supernatural frequently appears to and is shaped by the individual based on their personality and experience, so that different people are likely to see different manifestations or not see anything at all. I cannot imagine “The Turn of the Screw”, with its very fine line between neurosis and haunting appearing without the influence of Le Fanu any more than I can imagine a modern masterpiece like A. S. Byatt’s Swedenborgian novella “The Conjugial Angel” appearing without knowledge of “Green Tea”, “Squire Toby’s Will” and several others among Le Fanu’s Swedenborg influenced stories. The situation in “Green Tea” appears in different guises among the work of several later supernatural fiction writers, reshaped according to their own inclinations and concerns. Brian: Le Fanu certainly has many admirers: Henry James, James Joyce, Elizabeth Bowen–I recently learned that comedian Matthew Holness is a massive Le Fanu fan, and I very much suspect that the “evil monkey” in Family Guy is an homage to Le Fanu too. But admittedly it’s a little harder to see exactly Le Fanu’s influence in the same way one might find Lovecraft’s or Machen’s fingerprints all over a modern writer’s tale. Which isn’t to say that the influence isn’t there. It’s just that sometimes it’s not as overt. 5. What’s next for Swan River Press? Brian: Lots of things! I don’t like to talk too much about projects that aren’t currently with or about to go to the printer. Just on the off-chance that something falls through. But currently I’m working on the fourth issue of The Green Book, which is the second of our Le Fanu issues this year. It’s got some interesting Uncle Silas content because this year also happens to be the 150th anniversary of Le Fanu’s best-known novel. And a great piece on an early stage adaptation of “Carmilla”. Apart from that, I’m hoping to reprint before the end of the year Mervyn Wall’s delightfully vicious fantastical satires The Unfortunate Fursey and The Return of Fursey, a pair of novels I love and can’t wait to share with those who haven’t yet read them. Wall is one of Ireland’s overlooked authors and deserves to be rediscovered. I may have another surprise before the end of the year, but that’s . . . well, that’s a surprise. This entry was posted in News and tagged A. S. Byatt's Swedenborgian novella "The Conjugial Angel", arthur machen, Brian J Showers, Carmilla, Elizabeth Bowen, H P Lovedraft, Henry James, James Joyce, M.R. James, Mervyn Wall, Sheridan Le Fanu, Swan River Press, The Unfortunate Fursey and The Return of Fursey, Uncle Silas. Bookmark the permalink.